A decision by Carmarthenshire County Council's planning committee earlier this year (see previous posts here and here) to grant permission for a wind turbine at Mwche Farm in Llansteffan is to be challenged in court in a judicial review which will be heard in the New Year. The turbine will be visible from Dylan Thomas's Boathouse and writing shed in Laugharne, and residents argue that the planning committee acted irrationally in rejecting advice from planning officers that the turbine would be a “discordant element and an alien intrusion within an historic landscape of exceptional sensitivity”. The High Court also considered it grounds for a review that the Committee took into account an inaccurate statement made by Councillor Daff Davies at the planning meeting, who told the Committee that the location of the proposed turbine was obscured from the Dylan Thomas Boathouse by woodland. The Committee refused to conduct a site visit to the Laugharne side of the estuary. This once again throws the spotlight on Cllr Daff Davies, who is Chair of Council and in effect the "first citizen" of Carmarthenshire, representing the county and its people to the wider world, although his local community council decided that he was not fit to chair their meetings. 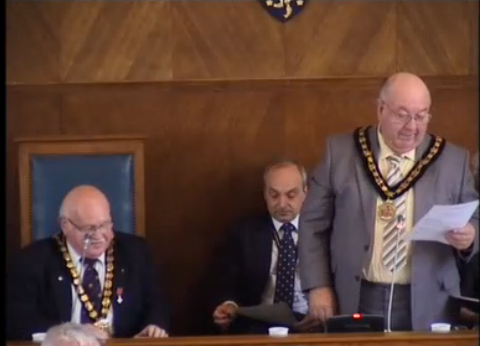 Whether he is fit to chair the County Council is something you will be able to decided for yourselves when you can see him in action at today's meeting of the full council. In siding with the applicant, who happens to be a personal friend, and going against the clear wishes of the people he was elected to represent, Cllr Davies was acting in the veritable traditions of the county's "Independent" group - a world of funny handshakes and often murky business interests. Of wider concern is that the legal challenge is likely to cause other councillors on the planning committee to get cold feet when it comes to rejecting planning officers' recommendations in more deserving cases. It is still relatively rare for councillors to reject the advice of planning officers, and on a number of occasions when they have rebelled, behind-the-scenes arm twisting has ensured that decisions on controversial schemes (e.g. housing developments at Penybanc and Waungilwen) have been reversed. Sadly, Elmer's legacy is likely to be hang like a cloud of slurry fumes over communities across Carmarthenshire for years to come. Unfortunately, 'Independents' tend to be farmers, landowners and the like wanting representation on councils in order to do each other favours with, as in this case, planning permission. This explains why there are so few 'Independents' in urban areas. Due to a sharp decline in the demand for brown envelopes many small businesses have cancelled their standing orders for this commodity. In fact futures for the entire range of brown envelopes have been removed from the blue chip investment lists by leading hedge fund managers. Stocks gave back early gains and turned dangerously negative in afternoon trading as major indexes pulled back after, earlier in the year, hitting new intraday record highs. In a press release it was stated that the declines were led by a comprehensive report by the Welsh Local Government Association into the Carmarthenshire County Council’s governance. This caused a plunge of more than 80% due to the serious and dramatic decline in demand. This includes the smallest, as usually required for church collections, to the more substantial ‘big deal’ brief case sized brown envelopes. In an attempt to maintain the business of brown envelopes and thus protect the employment of people in the paper industry the authorities suggested that any stocks should be marketed focusing on the potential for making unsolicited gifts to independent organisations that maintain the beauty of the countryside such as The National Trust, the RSPB etc. This could result is keeping a balance between the surplus funds that previously had been allocated to various governing personnel and by so doing preserve the brown envelopes industry while at the same time protecting the vulnerable eco system as recommended in a recent document by DEFRA. In a message from HRH Prince Charles he confirmed his belief that people were losing sight of the importance of the countryside. This fact is easily demonstrated by the brutal destruction of habitats for wildlife in hedges and roadside verges as well as farming methods that destroy the natural balance of sustainable nature. Such destruction of habitats is further exacerbated by the proliferation of ineffective wind turbines which give already wealthy landowners a substantial ‘unearned’ income. A tax expert has suggested that this income be formally classified as ‘unearned’ and therefore subject to much higher tax rates.